﻿I am a journal 'aholic'. Anything that looks like a journal I almost always have to have. Needless to say, I have quite a stash of recycled materials and ephemera in my book making endeavours. You can see some results of my efforts on this page. I have a number of boxes of ephemera I have collected over a number of years. Brochures, tickets, labels, newspaper and magazine cuttings, baggage tags from airlines, postage stamps, post bags etcetera much of it I had collected while in Australia﻿. There are stories behind my collections and you never know where and what the inspiration of the collection might lead to. On this page are some books I have made. 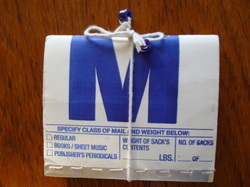 One a small booklet using a label which came attached to a large poly-type sack that encased a couple of large books I had bought online. 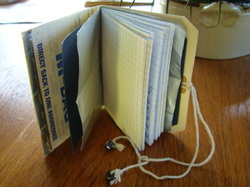 Handmade book from stringed label. Open view of label booklet. 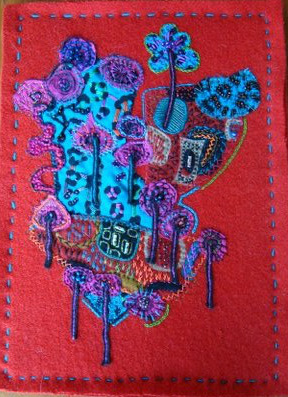 Handmade journal with recycled wool blanket cover with hand embroidery and fabric embellishment.